I have a 5-year old little girl at home, which means we read a whole lot of Fancy Nancy. If you haven’t heard of Fancy Nancy it’s actually a fun series. Nancy is an imaginative, flamboyant girl who relishes the fancier things in life. 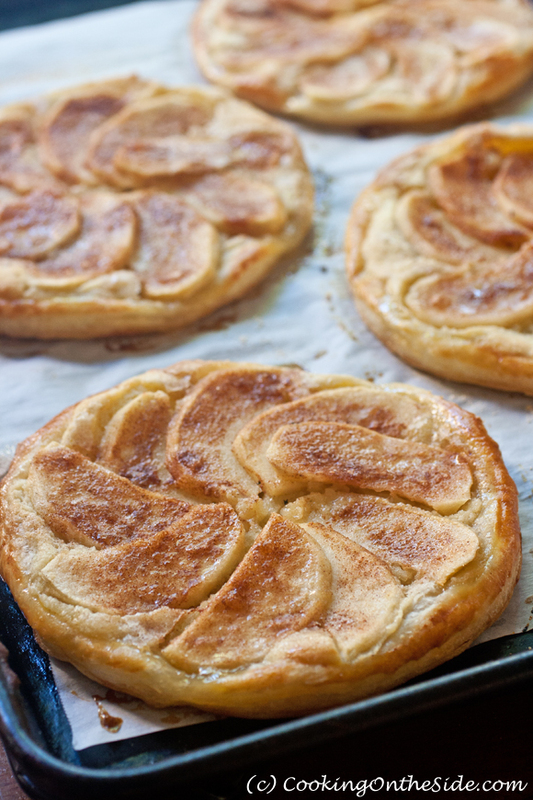 For her, apple tarts with almond filling taste way better if they have a fancy name like Apple Frangipane Galettes (oooh la la)!. I’ll admit, I had no idea what “frangipane” was until I read through the recipe I found on the back of the Bob’s Red Mill Almond Flour bag. In fact, I still wasn’t entirely sure, as there was nothing called “frangipane” in the ingredients list. It turns out that it was just the name of the filling for these simply incredible puff pastry galettes – almond meal, mixed with butter, sugar, flour and eggs. 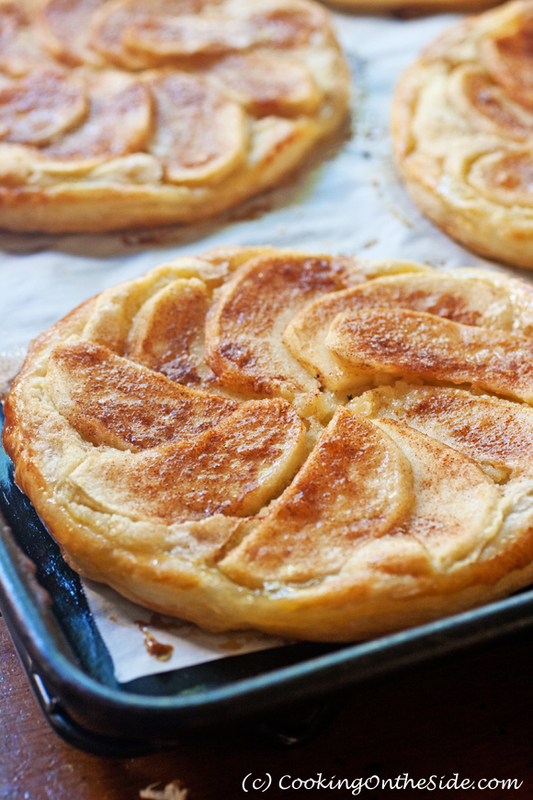 They may look and sound a little fancy, but these Apple Frangipane Galettes are actually very easy to layer together. And, with fresh autumn apples, they are positively delectable (that’s fancy for super delicious)! Line baking sheet with parchment paper; set aside. In a large bowl, beat butter and powdered sugar until light and fluffy. Beat in almond meal and white flour. Beat in 1 egg and almond extract; set aside. On a lightly floured surface, roll out puff pastry (if necessary) to a 12″ x 12″ square. Using a 6″ pie plate cut out four circles of dough and transfer to the prepared baking sheet. Put about 3 tablespoons of almond mixture in the center of each pastry round and spread out, leaving about 1/2″ edge of pastry showing. Beat the remaining egg lightly and brush the pastry edge with the beaten egg. Place apples on top of the almond mixture in a spiral leaving the pastry edge showing. Mix together granulated sugar and cinnamon; sprinkle evenly on top of the apple slices. Drizzle 1 teaspoon of the melted butter on top of each galette. Refrigerate the galettes on the baking sheet for 15 minutes. Bake at 375° F for 18 to 20 minutes or until golden brown and the pastry is puffed. This looks delicioous! Can’t wait to try this! How fancy! But also very approachable! I will use this at thanksgiving for an alternate dessert if someone does not want pie. Looks like it may also be good cool as a sweet breakfast treat. So beautiful! I can’t wait to try these. I saw the subject line and couldn’t remember where I heard Frangipane from – FANCY NANCY -lol!! Love it!! Dang, Kathy. I scrolled right past the Melt post and got stuck on this photo. Dying here! Want this now! I am sooo making this! It looks heavenly! I’ve made this so many times now, it’s my go-to dessert. We love it. For gifts I make in a long rectangular tart pan. Friends can’t get over how delicious it is and assume it’s difficult to make. I just let them think what they want! Thanks for sharing.